Stage-Gate International continues to be the globally recognized and trusted brand that enables companies of all sizes and in all industries to achieve new product development success. Scott J. Edgett and Robert G. Cooper’s journey to uncover innovation management best practices began with their passion to understand why some new products succeeded in the marketplace while others failed. This curiosity led them to undertake numerous ground-breaking research studies to benchmark hundreds of new product launches, to determine what successful new product development teams and companies were doing differently – the critical practices that separated winners from losers. Several companies took note of these important findings and looked to Scott Edgett and Robert Cooper’s expertise to design a model to guide successful new product development. 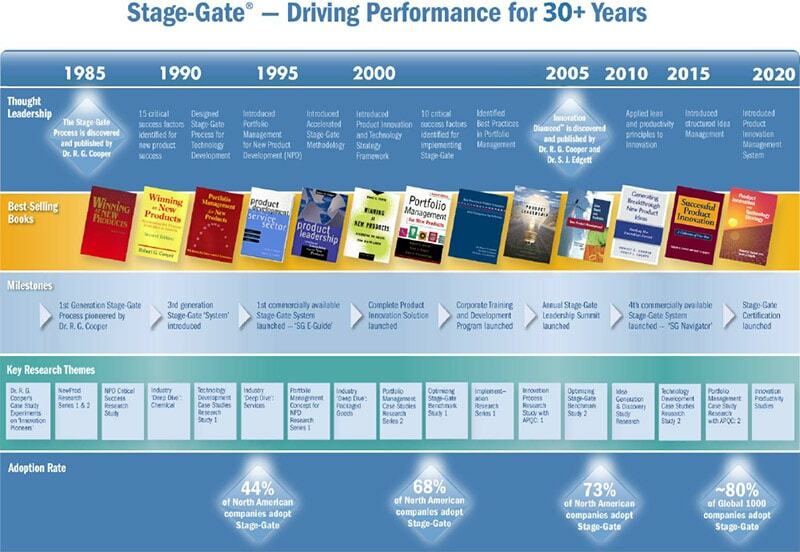 Working with early pioneers like ExxonMobil, DuPont, Royal Bank, and Procter & Gamble, led to the development of the Stage-Gate® Model, the world’s most widely, implemented new product development process. Scott Edgett, Robert Cooper, and their team continued their research into what makes for successful product innovation management, developing methods and setting industry standards for critical topics including new product portfolio management, product innovation and technology strategy, and the Innovation Performance Framework®. Today, our Stage-Gate experts continue to enable companies to drive organizational excellence in product development by applying and tailoring these proven practices.